We are embracing the new Change4Life campaign ‘Make a swap when you next shop’. This campaign is in light of the new statistic showing that 34% of children leaving primary school in the UK are overweight. The campaign aims to encourage families to cut back on sugar in their weekly diet by making simple swaps when shopping. This involves being mindful of the sugar content in the foods you might usually choose, and opting to swap them for a healthier option with less sugar-content. Below you will find two easy-to-read documents showing simple swaps and easy, healthy recipe ideas. We will be embracing this within school too as part of the children’s PSHE curriculum this half term. 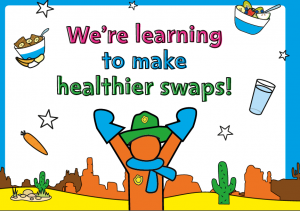 We welcome any pictures of you making simple swaps and/or making any healthy recipes at home. Children will be rewarded with dojo’s, as we aim to promote a healthy lifestyle at all times. Thank you for your support. • understand where food comes from. • understand seasonality, and know where and how a variety of ingredients are grown, reared, caught and processed. We have recently introduced a band system at lunchtimes. The children are able to pre-order their lunch in the morning. This system reduces queuing at lunchtime and so far seems to be a success. Please note that the cost of school dinners from September 2018 for Key Stage 2 will be £11 per week or £2.20 per day. Please inform the office if you wish your child to have school dinners in September. Our fruit trolley is now up and running. Children are able to buy fruit at playtime for 10p. We hope your child likes our new and improved dinner menu. We are now offering a butter, cheese, beans or tuna option for jacket potatoes for those children who prefer this. 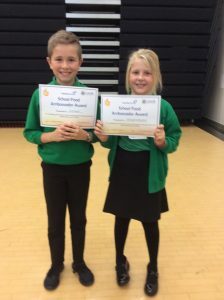 At Rothwell Primary School our Healthy School Food Ambassadors are Jack and Ashleigh from Year 5. These children have been selected and trained to monitor and influence Healthy Food at our school. Their job includes gathering feedback and reporting to the wider school to create change. Our school food ambassadors are important because they support each child’s journey to grow up and stay healthy. They will help to create a positive lunchtime experience and champion the way for healthy eating. Jack and Ashleigh are knowledgeable and enthusiastic about healthy food and nutrition! Change for Life – This is a great website and free app that gives you lots of food facts, recipes and activities in order to stay healthy. Go Noodle – A brilliant website with lots of fun and active ways to get kids moving!